Virtually everyone who has applied their trade as an alfalfa researcher has done a seeding rate study at some point in their career. The scientific literature is full of such studies and most come to the same conclusion: very little of what we dump in the drill ends up as a productive alfalfa plant that lives to see the next presidential election. It’s not anyone’s fault, but rather that inefficiency is a part of the deal. However, there should be some consideration given to cutting losses simply because input costs, including seed, are not getting any cheaper. To take a closer look at the issue of alfalfa seeding rates, let’s start at the beginning with the seed itself. There are about 199,000 alfalfa seeds per pound. If that one pound was evenly spread over one acre (43,560 ft2), there would be in the neighborhood of five seeds per square foot. So pick your seeding rate, multiply by five, and that’s how many seeds per square foot are sitting a fraction of an inch below the soil surface waiting to become productive plants when you pull out of the field with your seeder or drill. So let’s begin with a 15 pound per acre seeding rate (Figure 1). That equates to 75 seeds per square foot. Research suggests that only about 50 to 70 percent of those seeds will be accounted for as seedlings after emergence is complete in three to four weeks. Using a 60 percent average, that leaves us with 45 seedlings per square foot. At this point, it’s a survival of the fittest game. As plants become bigger and compete for available resources, another 40 to 50 percent will be gone by the next spring. This leaves us with about 25 plants per square foot as our stand heads into the first production year. During the next 12 months, expect another 30 to 40 percent loss of plants, leaving us with 8 or 9 productive plants per square foot, a batting average of .120 from our original 75 seeds. What impact does seeding rate have on final stands? It seems intuitive that more seeds dropped per square foot should result in more seedlings and plants per square foot. Seeding studies show that higher seeding rates do result in more seedlings through the end of the seeding year. Further, very low seeding rates (below 8 pounds per acre) often have fewer seedlings and lower total-season yields in the seeding year. However, as seeding rates increase, the percentage of plants that die during the first year also increases. Research from Missouri and Pennsylvania recently showed a 45 percent first-year plant mortality for a 10 pound per acre seeding rate and a 60 to 70 percent mortality for seeding rates over 20 pounds per acre. It’s been an almost universal research finding throughout the Midwest and Eastern U.S. that plant densities and yield are nearly equal for seeding rates of 10 pounds per acre or more in the year following seeding. So what’s the optimum alfalfa seeding rate? Recommended seeding rates vary with region and can be obtained at your local extension office. Research strongly suggests that there is little benefit to seeding over 10 pounds of pure live seed per acre in the Midwest and Eastern U.S. regions. In Wisconsin, 12 pounds of pure live seed per acre is recommended in most situations. This equates to dropping 60 seeds per square foot. 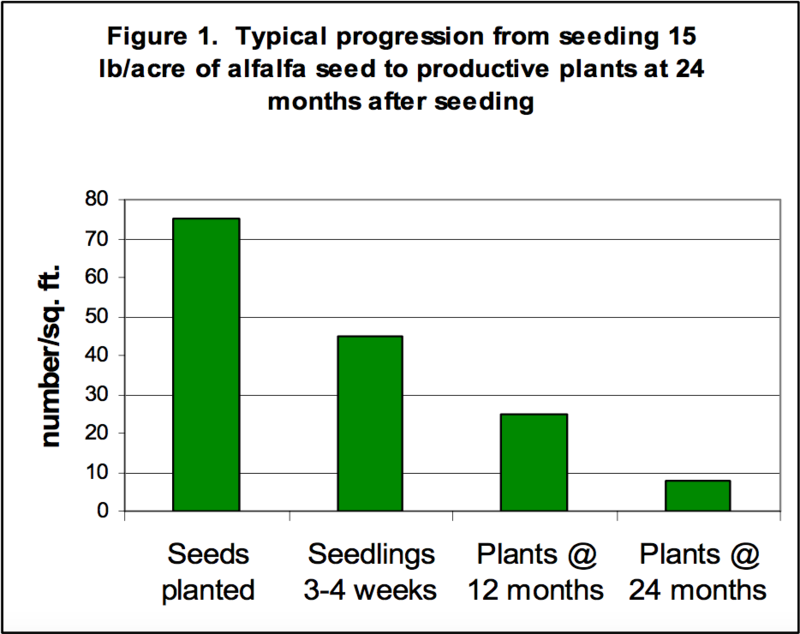 As alfalfa seed becomes more expensive and transgenic traits come with a technology fee, reducing seeding rates to the agronomic and economic optimum is more easily justified. Further, it’s always better to invest in good alfalfa genetics and seed at an optimum rate than to buy the cheap stuff and seed at a higher rate. How is the desired seeding rate obtained? Obtaining the desired seeding rate starts with seeder calibration. Factors such as seed size, seed coating, and the percentage of pure live seed (indicated on seed tag) will impact how the seeding implement needs to be set for the desired result. Further, there may be times where it makes good sense to increase seeding rates. These include situations where the seedbed is less than optimum and where the desired seeding depth is difficult to obtain (either too deep or too shallow). Finally, because seeding equipment and planting conditions vary significantly, it might be well worth your time to track plant densities on your own farm. Count plants per square foot about a month after seeding, then in the fall of the seeding year, and again the next spring. At this point, we like to see about 15 – 25 plants per square foot to achieve maximum yields. Don’t worry if your numbers are a bit lower, plants will likely compensate with more stems per plant and excellent yields are still attainable. 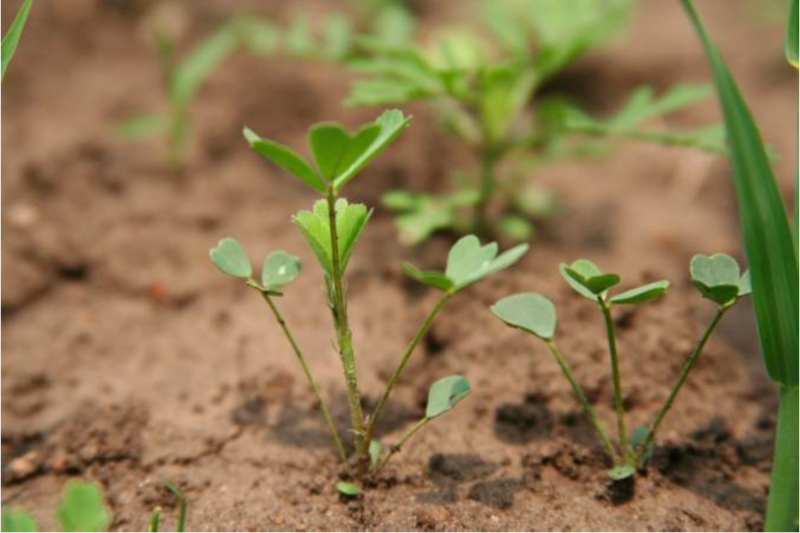 Seed costs, spread over the life of a stand, currently comprise a small percentage of the total alfalfa production investment. Still, it’s generally hard to justify over-seeding alfalfa.